My Mortal Kombat II experience and fascination is more on the entertainment side rather than competitive side. Mortal Kombat brings elements to fighting games that Street Fighter games can’t provide, like more unique characters, moves in general, and of course, fatalities. 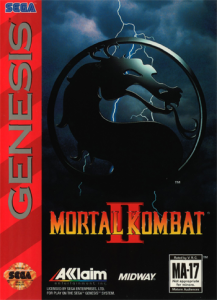 I was drawn into the Mortal Kombat series through the arcade version of Mortal Kombat, but Mortal Kombat II was my first opportunity to own the game on the Sega Genesis. Back then, the moves and fatalities were not listed in-game and had to be found out. I distinctly remember printing out all the fatalities, but even more than that, this was the first version that had babalities and friendships. With such a wide array of characters to choose from, figuring out and executing each fatality, stage fatality, babality, and friendship was a great source of entertainment and possibly gave me the closest mentality of being a ‘completionist’ I’ve ever had. The actual matches themselves always gave enjoyment, even if after a loss because of the crazy fatality at the end. For the fighting genre, I find the Mortal Kombat franchise to be far superior entertainment wise, with Mortal Kombat II being up there in the top spot. I personally don’t feel any of the newer versions come close because Mortal Kombat II found the happy balance between ‘vanilla’ fighting and gratuitous gore that the newer versions have failed to find. I’m still hoping for an HD version of Mortal Kombat II with online matchmaking so I can relive the excitement I had in the 1990s.